Golf at Orsett dates back to the late 19th century when several locals caught the Scottish golf bug and laid out a few rudimentary holes on Mucking Heath, which is located in the wonderfully named area of Mucking and Fobbing. Records are sketchy, but in 1898 the recommendation was to form a golf club and, in 1899, a 4-hole Orsett Golf Club was born. In 1929 the great James Braid was paid 21 guineas to remodel and extend Orsett to a full 18 holes. Since then, the club has moved from strength to strength and most of Braid’s original design is evident on today’s supremely challenging heathland layout. Orsett is set on the northern banks of the Thames and the wind tends to funnel up the estuary making playing to handicap a serious challenge. The county of Essex is not blessed with ideal golfing ground as the majority of the county is largely made up of heavy clay, but the course at Orsett Golf Club is set on pleasantly undulating heathland terrain. The course opens up with a medium length par five and, with two further par fives on the outward nine, there are real birdie opportunities available for the big hitters. Sandwiched between the par five 5th and 7th is the wonderful signature short par four 6th which is set in a sunken valley which was formerly a sand quarry where sand was extracted for filling James Braid's early bunkers. With just one par five on the inward nine, you need to make your score going out as coming home – especially 17th and 18th – is invariably played into the prevailing wind. Orsett is certainly one of the premier courses in Essex and consequently is used as a Regional Qualifying track for the Open Championship. Many trees and bushes have been removed over the years in an attempt to retain the heathland status quo and we think it’s essential to continue this work because Orsett is undoubtedly a rare sandy jewel in the Essex mud. This course is a lot of fun to play with a healthy membership and a warm welcome to guests. Many of the holes are bordered by some great looking gorse, which I have to say is pretty rare on courses in this part of South-East England, maybe Aldeburgh in Suffolk is most comparable also with plenty of gorse-bordered fairways. I would call the first five holes of the course, pretty good – all on flat land and a little up and down without standing out. The first ‘pick’ hole is the 6th – only 320 yards from the back tee and the whole hole is surrounded by trees, gorse and bluebells – pretty as a picture and two or three ways to play it; drive and a flick or a couple of mid-irons – nice choices. The 9th and 10th holes are very strong par-4’s, both dog-legging to the left; the 9th is 455 yards and the 10th just under 400 yards. The 12th hole is the best par-3 on the course by far – 147 yards with six bunkers protecting, a 2-tiered green and more of the good looking trees and gorse all around – the highest compliment is that this hole would not look out of place on any Open Championship course. The holes 15th – 17th are my least favourite as they seem to be across land that is more open and a little out of character with the rest of the course – not bad holes but just not as good. The closing hole is very strong, a 400+ yard par-4 with a tight drive to a flat looking green that has some subtle breaks on it and positioned right in front of the clubhouse. A warm Essex welcome is extended to all visitors in the 19th hole, where the debate of the county’s #1 course will continue for ever; for me, Thorndon Park is the better course but in saying that, Orsett is likely to be open longer during the now extended English winters due to the great heathland surface. Played at Orsett today 27 Jan 14 as part of a small society. The weather has been very wet of late, but all tees/greens at Orsett were in play. Really surprised at how good condition the fairways and greens were in. We played off the yellows and off my h/cp (18) I found the course to be a fair test. Very much enjoyed the 6th, 10th, 11th, and 12th holes and the closing 4 holes are all challenging. Would definitely visit again and recommend others to play here. All 19 of our group complimented the course and we received a warm welcome too. Rating a course is of course subjective, but I would say 4 to 5 is right. The bunkers in the photo were shaped by Fred Green to a design by Gaunt Golf Design. Orsett I think is my favourite Essex course, just ahead of Thorndon Park. Both are good tracks but neither is great compared to many others to the west of the M25. Orsett may be the best course in Essex, but that’s not necessarily a huge compliment as there only a few commendable courses in the whole county. Orsett plays like a seaside course in places and from the 7th the views from the high ground serve as a gentle reminder that you are playing golf close to the stark, cheerless and industrial Thames Estuary. The short par four 6th is perhaps my favourite hole which, depending on the wind direction, can be reached with a good drive depending on how much of the right to left doglegging hole you are brave enough to take on. 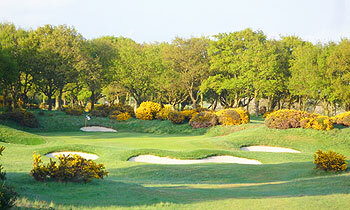 I’ve played Orsett a couple of times and think that the design is good and the ground ideal for golf. The greens are invariably in good nick but the general condition of the tees and surrounding areas was a bit on the side of scruffy. Overall a good course that could be No.1 in Essex. So many course seem to be the "tricked up" variety these days. This one isn't. What you see is what you get, and what you get is good. Sitting on a sand base, which itself is a rarity in clay based Essex, the drainage is exceptional, and if you can stay on the short stuff you can guarantee a clean pair of trousers no matter what the elements have thrown at you when you finish. Mud is unheard of, except on a few well-worn paths. Being not far from the Thames, the wind can make staying on the short stuff tricky. The gorse isn't as dense as it used to be, the hot summers of the last few years have killed a lot of it off, and a lot more "normal" trees have been planted, giving the heathland course more of a parkland feel now. Couple that with some savage rough come summer, the course really shows it teeth. My choice of hole was the short par four 6th. Trouble left and right with an undulating links like fairway. You will find the natives a freindly bunch. You get the feeling of links golf here, the ground is tight and springy, and when the wind blows it can really impact on your club selection. 11 and 12 are probably the stand out holes, a good testing par 5, not long, but you need to be in the right place off the tee. The short 12th is a great par 3, with a tricky green. Quite rightly used as an Open qualifying course.